insta. obsessed. // pt. 2. - bitte.und.danke. If you're #instaobsessed, then you're in for a real treat today. I realize that it's been far too long since I've shared a roundup of my favorite Instagram users (here's pt. I in case you missed it!). For the most part, I am very picky (read: highly selective) and make it a point to only follow those who post photos that I genuinely enjoy. As you can imagine, who I follow fluctuates as I discover the latest and greatest users sharing stunning imagery and visual stories. But, then again, that's probably pretty true for most of us. Without further ado, here are six Instagrammers that I'm currently loving — enjoy! @iamgalla (Adam Gallagher, "Creative Director 23, 5'11, Libra"): Meet Adam Galla: the epitome of cool. Founder of the blog, I AM GALLA, Adam is a blogger/stylist who has succeeded in striking the perfect balance between his impeccable style and worldly travels. @daphnemodeandthecity (Daphné M. | Mode & The City Fashion and lifestyle blogger since 2007. Paris, FR. 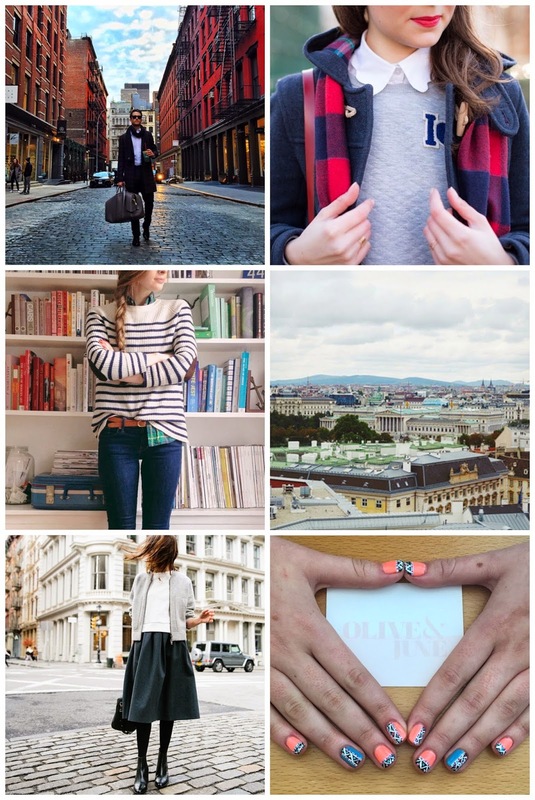 ): When preppy meets Parisian, you get this. I recently stumbled across Daphné's Instagram account and she's quickly become a favorite of mine. Besides the fact that she is as cute as a button (could I please borrow her collection of Fair Isle jumpers?! ), her dreamy photos of Paris have given me a serious case of wanderlust. @stephens_louisa (stephens, louisa. lamp lifeboat ladder | detroit mi. ): In the midst of what seems like an infinite number of preppy Instagram users, Louisa flaunts by far one of the best feeds out there. Not just restricted to #ootd snapshots (which I do adore! ), she also has a way with documenting little tidbits and snippets from her everyday life. For a well-curated feed and simple aesthetic, Louisa is your go-to gal. @kadyinvienna (Kady K, 21-year-old Vienna based university student and photography enthusiast. ): No Instagram roundup would be complete without at least one Vienna-based feed. I've come to appreciate not only Kady's artsy perspective and attention to detail, but also her ability to capture Vienna from a non-touristy point of view. As part of the #igersaustria team, she knows firsthand all of the city's nooks and crannies, and her Insta account is reflective of that. @madewell1937 (Madewell, denim obsessives. infovores. chambray. ): I'm not going to lie, this one's kind of a no-brainer. I'm a sucker for all things Madewell — the effortless cool-girl aesthetic, the brand's always on-point branding, the artful details and oh, the clothes. The fact that Madewell recently did their December shoot in Vienna makes me even more inclined to include them in this roundup. Now that I've shared my favorite Instagrammers, it's your turn! Which Instagram users’ photos do you find yourself tapping “like” one too many times? P.S. - Check out my recent article on Brit + Co for "15 Tips to Turn You Into an Instagram Pro." Omg, just started following Madewell, I love them! I love following @hungrybetches @dyllrose and @jen_murlow!